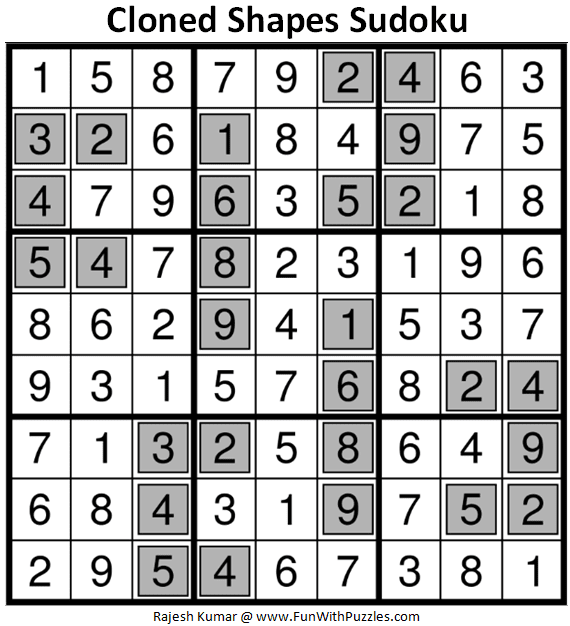 Cloned Shapes Sudoku is nothing but a different name for Clone Sudoku. 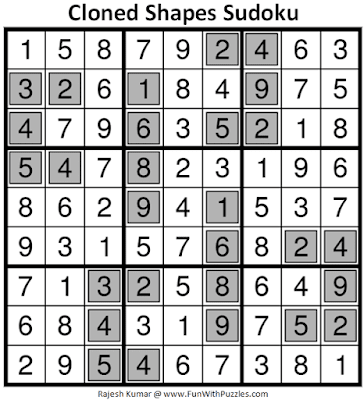 Earlier Clone Sudoku used to have only one region which is duplicated along with its numbers. Slowly Clone Sudoku started having more than one similar looking region without modifying the rules of the original Clone Sudoku. This name Cloned Shapes Sudoku appeared in 4th round of WPF Sudoku Grand Prix 2018. However it is same as Clone Sudoku. Even in World Sudoku Championship 2017 there was Clone Sudoku containing more than one shape. Anyway this Cloned Shapes Sudoku, I am publishing in Fun With Sudoku Series as 348th Sudoku Puzzle in this Series. Standard Sudoku Rules apply. Additionally the position of the digits inside each shape is fixed. It means the same digits have to be placed at the same position inside the identical shapes. The digit may appear more than once in a shape. Answer of this Cloned Shapes Sudoku puzzle can be viewed by clicking on button. Please do give your best try to solve this Sudoku puzzle before looking at the answer. This Cloned Shapes Sudoku Puzzle I am publishing as #348th Sudoku puzzle in Fun With Sudoku Series. Here are the next and previous Sudoku puzzles published in this series. 9:46.Would have been faster had I not used a false deduction between the solve which made me erase some digits.Good one.